This poem by Alfred, Lord Tennyson, was written to memorialize a suicidal charge by light cavalry over open terrain by British forces in the Battle of Balaclava (Ukraine) in the Crimean War (1854—1856). The charge was led by Lord Cardigan against Russian forces. Lord Cardigan had intended sending the light brigade to pursue retreating Russian artillery but due to a miscommunication error in the chain of command, the light brigade was instead sent on a frontal assault against a very well-prepared force with excellent defenses. Two hundred and forty-seven (247) men were killed or seriously wounded that day. Well, there is another valley of death—a digital valley sometimes deep, sometimes wide. That valley occurs when your eight-year-old computer, running on MS Windows XP, crashes and burns. As you probably know, Microsoft, in their infinite wisdom, quit supporting XP two years ago. XP was, in my opinion, the most robust software MS has produced to date. Oh by the way, GOOGLE Chrome, Firefox, Safari, Yahoo, and probably other browsers I know nothing about have stopped support also. Talk about the valley of death. This post was written by hand with a great fear and trembling, hoping to back in business fairly quickly. How long oh how long until I get my new computer? I have over the years purchased my last three computers from Affordable Computers of Chattanooga. I get to specify each component used, the memory, and all of the “bells and whistles” my little heart can afford. They do a great job, provide a two-year warranty and all with great support. They are now, as I write, making considerable efforts to copy files from my old computer into the hard-drive of my new “machine”. I certainly wonder how much can be copied over. How far gone was the hard-drive in my old system? I say fear and trembling because, I skipped Vista, MS 7, MS 8 and MS 10 because I was told they were unstable. XP was the system. Keep using it. Disregard the very frequent warnings of waning and nonexistent support. OK, I did and much to my discredit. I suppose if you are reading this now that change was successful. BACK IN BUSINESS. I certainly hope to get caught up with my posting. Thank you for hanging in with me. It is absolutely amazing as to the number of “hacks” perpetrated upon Federal agencies of the United States. This statement could also be made for non-Federal institutions such as banks, independent companies, and commercial establishments from Starbucks to Target to the DNC. Let’s see if we can quantify the extent by looking at just a few relative to our Federal government. Department of Health and Human Services (HHS), August 2014. National Oceanic and Atmospheric Agency (NOAA), November 2014. United States Postal Service (USPS), November 2014. Department of State, November 2014. Federal Aviation Administration (FAA), April 2015. Department of Defense, April 2015. St. Louis Federal Reserve, May 2015. Internal Revenue Service May 2015. U.S. Army Web site, June 2015. Office of Personnel Management (OPM), June 2015. The list is very impressive but extremely troubling. QUESTION: Are top U.S. government leaders serious about cyber security and cyber warfare, or not? If the answer is a resounding YES, it’s time to prove it. Is cyber security high enough on the list of national defense priorities to warrant its own unified command? Clearly, the answer is YES. Two major breaches last year of U.S. government databases holding personnel records and security-clearance files exposed sensitive information about at least twenty-two point one (22.1) million people, including not only federal employees and contractors but their families and friends, U.S. officials said Thursday. Think twenty-two (22.1) million names, Social Security numbers, telephone numbers, and addresses being held by the Chinese government. So again, clearly the time for an independent Cyber Security Command is upon us or approaching quickly. Placing Cyber Command among these organizations would take it from under the U.S. Strategic Command where it resides today as an armed forces sub-unified command. Over our history there have been two major structural changes to our Federal Government certainly needed for added security and safety. World War II had been over for two years and the Korean War lay three years ahead when the Air Force ended a 40-year association with the U.S. Army to become a separate service. The U.S. Air Force thus entered a new era in which airpower became firmly established as a major element of the nation’s defense and one of its chief hopes for deterring war. The Department of the Air Force was created when President Harry S Truman signed the National Security Act of 1947. Lawmakers explained why they felt the U.S. needed to evolve the Army Air Corps into an independent branch in a Declaration of Policy at the beginning of the National Security Act of 1947: To provide a comprehensive program for the future security of the United States; to provide three military departments: the Army, the Navy, and the Air Force; to provide for their coordination and unified direction under civilian control and to provide for the effective strategic direction and operation of the armed forces under unified control. General Carl A. Spaatz became the first Chief of Staff of the Air Force on 26 September 1947. When General Spaatz assumed his new position, the first Secretary of the Air Force, W. Stuart Symington, was already on the job, having been sworn in on 18 September 1947. He had been Assistant Secretary of War for Air and had already worked closely with General Spaatz. The new Air Force was fortunate to have these two men as its first leaders. They regarded air power as an instrument of national policy and of great importance to national defense. Both men also knew how to promote air power and win public support for the Air Force. Eleven days after the September 11, 2001, terrorist attacks, President George W. Bush announced that he would create an Office of Homeland Security in the White House and appoint Pennsylvania Governor Tom Ridge as the director. The office would oversee and coordinate a comprehensive national strategy to safeguard the country against terrorism, and respond to any future attacks. Executive Order 13228, issued on October 8, 2001, established two entities within the White House to determine homeland security policy: the Office of Homeland Security (OHS) within the Executive Office of the President, tasked to develop and implement a national strategy to coordinate federal, state, and local counter-terrorism efforts to secure the country from and respond to terrorist threats or attacks, and the Homeland Security Council (HSC), composed of Cabinet members responsible for homeland security-related activities, was to advise the President on homeland security matters, mirroring the role the National Security Council (NSC) plays in national security. Before the establishment of the Department of Homeland Security, homeland security activities were spread across more than forty (40) federal agencies and an estimated 2,000 separate Congressional appropriations accounts. In February 2001, the U.S. Commission on National Security/21st Century (Hart-Rudman Commission) issued its Phase III Report, recommending significant and comprehensive institutional and procedural changes throughout the executive and legislative branches in order to meet future national security challenges. Among these recommendations was the creation of a new National Homeland Security Agency to consolidate and refine the missions of the different departments and agencies that had a role in U.S. homeland security. In March 2001, Representative Mac Thornberry (R-TX) proposed a bill to create a National Homeland Security Agency, following the recommendations of the U.S. Commission on National Security/21st Century (Hart-Rudman Commission). The bill combined FEMA, Customs, the Border Patrol, and several infrastructure offices into one agency responsible for homeland security-related activities. Hearings were held, but Congress took no further action on the bill. From the two examples above: i.e. Formation of the USAF and Homeland Security, we see there is precedent for separating Federal activities and making those activities stand-alone entities. This is what needs to be accomplished here. I know the arguments about increasing the size of government and these are very valid but, if done properly, the size could possibly be reduced by improving efficiency and consolidation of activities. Now is the time for CYBER COMMAND. On 13 October 2014 at 9:32 A.M. my ninety-two (92) year old mother died of Alzheimer’s. It was a very peaceful passing but as her only son it was very painful to witness her gradual memory loss and the demise of all cognitive skills. Even though there is no cure, there are certain medications that can arrest progression to a point. None were effective in her case. Her condition once again piqued my interest in intelligence (I.Q. ), smarts, intellect. Are we born with an I. Q. we cannot improve? How do cultural and family environment affect intelligence? What activities diminish I.Q., if any? Just how much of our brain’s abilities does the average working-class person need and use each day? Obviously, some professions require greater intellect than others. How is I.Q. distributed over our species in general? IQ tests are the most reliable (e.g. consistent) and valid (e.g. accurate and meaningful) type of psychometric test that psychologists make use of. They are well-established as a good measure of a general intelligence or G. IQ tests are widely used in many contexts – educational, professional and for leisure. Universities use IQ tests (e.g. SAT entrance exams) to select students, companies use IQ tests (job aptitude tests) to screen applicants, and high IQ societies such as Mensa use IQ test scores as membership criteria. The following bell-shaped curve will demonstrate approximate distribution of intellect for our species. The area under the curve between scores corresponds to the percentage (%) in the population. 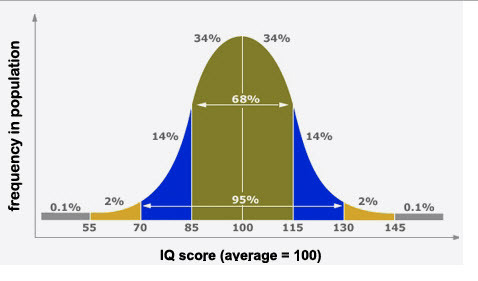 The scores on this IQ bell curve are color-coded in ‘standard deviation units’. A standard deviation is a measure of the spread of the distribution with fifteen (15) points representing one standard deviation for most IQ tests. Nearly seventy percent (70%) of the population score between eighty-five (85) and one hundred and fifteen (115) – i.e. plus and minus one standard deviation. A very small percentage of the population (about 0.1% or 1 in 1000) have scores less than fifty-five (55) or greater than one hundred and forty-five (145) – that is, more than three (3 )standard deviations out! As you can see, the mean I.Q. is approximately one hundred, with ninety-five percent (95%) of the general population lying between seventy (70) and one hundred and fifteen percent (115%). Only two percent (2%) of the population score greater than one hundred and thirty (130) and a tremendously small 0.01% score in the genius range, greater than one hundred forty-five percent (145%). OK, who’s smart? Let’s look. Gary Kasparov—190. Born in 1963 in Baku, in what is now Azerbaijan, Garry Kasparov is arguably the most famous chess player of all time. When he was seven, Kasparov enrolled at Baku’s Young Pioneer Palace; then at ten he started to train at the school of legendary Soviet chess player Mikhail Botvinnik. In 1980 Kasparov qualified as a grandmaster, and five years later he became the then youngest-ever outright world champion. He retained the championship title until 1993, and has held the position of world number one-ranked player for three times longer than anyone else. In 1996 he famously took on IBM computer Deep Blue, winning with a score of 4–2 – although he lost to a much upgraded version of the machine the following year. In 2005 Kasparov retired from chess to focus on politics and writing. He has a reported IQ of 190. Marlyn vos Savant—228. Marilyn vos Savant’s intelligence quotient (I.Q.) score of 228, is certainly one of the highest ever recorded. This very high I.Q. gave the St. Louis-born writer instant celebrity and earned her the sobriquet “the smartest person in the world.” Although vos Savant’s family was aware of her exceptionally high I.Q. scores on the Stanford-Benet test when she was ten (10) years old (she is also recognized as having the highest I.Q. score ever recorded by a child), her parents decided to withhold the information from the public in order to avoid commercial exploitation and assure her a normal childhood. Mislav Predavec—192. Mislav Predavec is a Croatian mathematics professor with a reported IQ of 190. “I always felt I was a step ahead of others. As material in school increased, I just solved the problems faster and better,” he has explained. Predavec was born in Zagreb in 1967, and his unique abilities were obvious from a young age. As for his adult achievements, since 2009 Predavec has taught at Zagreb’s Schola Medica Zagrabiensis. In addition, he runs trading company Preminis, having done so since 1989. And in 2002 Predavec founded exclusive IQ society GenerIQ, which forms part of his wider IQ society network. “Very difficult intelligence tests are my favorite hobby,” he has said. In 2012 the World Genius Directory ranked Predavec as the third smartest person in the world. Rick Rosner—191. U.S. television writer and pseudo-celebrity Richard Rosner is an unusual case. Born in 1960, he has led a somewhat checkered professional life: as well as writing for Jimmy Kimmel Live! and other TV shows, Rosner has, he says, been employed as a stripper, doorman, male model and waiter. In 2000 he infamously appeared on Who Wants to Be a Millionaire? answering a question about the altitude of capital cities incorrectly and reacting by suing the show, albeit unsuccessfully. Rosner placed second in the World Genius Directory’s 2013 Genius of the Year Awards; the site lists his IQ at 192, which places him just behind Greek psychiatrist Evangelos Katsioulis. Rosner reportedly hit the books for 20 hours a day to try and outdo Katsioulis, but to no avail. Evangelos Katsioulis—198. Katsioulis is known for his high intelligence test scores. There are several reports that he has achieved the highest scores ever recorded on IQ tests designed to measure exceptional intelligence. Katsioulis has a reported IQ 205 on the Stanford-Binet scale with standard deviation of 16, which is equivalent to an IQ 198.4. Kim Ung-Young—210. Before The Guinness Book of World Records withdrew its Highest IQ category in 1990, South Korean former child prodigy Kim Ung-Yong made the list with a score of 210. Kim was born in Seoul in 1963, and by the time he turned three, he could already read Korean, Japanese, English and German. When he was just eight years old, Kim moved to America to work at NASA. “At that time, I led my life like a machine. I woke up, solved the daily assigned equation, ate, slept, and so forth,” he has explained. “I was lonely and had no friends.” While he was in the States, Kim allegedly obtained a doctorate degree in physics, although this is unconfirmed. In any case, in 1978 he moved back to South Korea and went on to earn a Ph.D. in civil engineering. Christopher Hirata—225. Astrophysicist Chris Hirata was born in Michigan in 1982, and at the age of 13 he became the youngest U.S. citizen to receive an International Physics Olympiad gold medal. When he turned 14, Hirata apparently began studying at the California Institute of Technology, and he would go on to earn a bachelor’s degree in physics from the school in 2001. At 16 – with a reported IQ of 225 – he started doing work for NASA, investigating whether it would be feasible for humans to settle on Mars. Then in 2005 he went on to obtain a Ph.D. in physics from Princeton. Hirata is currently a physics and astronomy professor at The Ohio State University. His specialist fields include dark energy, gravitational lensing, the cosmic microwave background, galaxy clustering, and general relativity. “If I were to say Chris Hirata is one in a million, that would understate his intellectual ability,” said a member of staff at his high school in 1997. Terrance Tao—230. Born in Adelaide in 1975, Australian former child prodigy Terence Tao didn’t waste any time flexing his educational muscles. When he was two years old, he was able to perform simple arithmetic. By the time he was nine, he was studying college-level math courses. And in 1988, aged just 13, he became the youngest gold medal recipient in International Mathematical Olympiad history – a record that still stands today. In 1992 Tao achieved a master’s degree in mathematics from Flinders University in Adelaide, the institution from which he’d attained his B.Sc. the year before. Then in 1996, aged 20, he earned a Ph.D. from Princeton, turning in a thesis entitled “Three Regularity Results in Harmonic Analysis.” Tao’s long list of awards includes a 2006 Fields Medal, and he is currently a mathematics professor at the University of California, Los Angeles. Stephen Hawkin—235. Guest appearances on TV shows such as The Simpsons, Futurama and Star Trek: The Next Generation have helped cement English astrophysicist Stephen Hawking’s place in the pop cultural domain. Hawking was born in 1942; and in 1959, when he was 17 years old; he received a scholarship to read physics and chemistry at Oxford University. He earned a bachelor’s degree in 1962 and then moved on to Cambridge to study cosmology. Diagnosed with motor neuron disease at the age of 21, Hawking became depressed and almost gave up on his studies. However, inspired by his relationship with his fiancé – and soon to be first wife – Jane Wilde, he returned to his academic pursuits and obtained his Ph.D. in 1965. Hawking is perhaps best known for his pioneering theories on black holes and his bestselling 1988 book A Brief History of Time. The individuals above are living. Let’s take a very quick look at several past geniuses. I’m sure you know the names. I think this says it all. As always, I welcome your comments. Does anyone remember books? We tend to take for granted the notion that people of the world can or should be taught to read. In the early history of our country, books were somewhat a rarity. Most children were first taught to read from the Bible because that was sometimes all they had to read. If we go to the CIA Factbook for countries of the world, we see the ability to read is used as an indicator of poverty and development. In 1998, the UN defined eighty percent (80%) of the world population as literate, defined as the ability to read and write a simple sentence in a language. Reading was not always the universal goal for powerful rulers and kings, and in ancient times, literacy was the trade secret of professional scribes. A few centuries later, in Europe, literacy was defined as the ability to read and write in Latin. Later still, the bar was lowered, and people were considered literate if they could sign their names. In 1841, thirty-three percent (33%) of all Englishmen and forty-four percent (44%) of Englishwomen signed marriage certificates with their mark. We are now in the “information society” where access to the internet, books, magazines, newspapers, and other written documents seem to be readily available to just about everyone, at least in the United States. Unfortunately, regardless of the literacy programs already initiated in many of our public schools by our government, illiteracy continues to grow at an alarming rate. According to a study conducted in late April 2015 by the US Department of Education and the National Institute of Literacy, thirty-two ( 32) million adults in the United States can’t read above a fifth grade level, and nineteen percent (19%) of high school graduates can’t read. NOTE: THAT’S GRADUATES BY THE WAY!!!!!! According to the Department of Justice, “The link between academic failure and delinquency, violence, and crime is tied to reading failure.” Statistics back up this claim: eighty-five percent (85%) of all juveniles who interface with the juvenile court system are functionally illiterate, and over seventy percent (70%) of inmates in America’s prisons cannot read beyond a fourth grade level. As you can see, literacy rates represent a real problem in our country. As a species, our thirst for knowledge is evident by recognizing the great libraries that existed in ancient times as well as those existing today. Why don’t we all get in Mr. Peabody’s Way-back machine and take a look at the great libraries in history. Then we will examine the great libraries of today. ALEXANDRIA, EGYPT— History tells us that the first ‘universal’ library was the Great Library & Mouseion in Alexandria, Egypt. Hungry for conquest and knowledge, Alexander the Great spent the last eleven (11) years of his life (334 to 333 B.C.) exploring the world. To broaden the enterprise, he dispatched scholars to unexplored regions to gather knowledge and map their journeys. After the death of Alexander the Great, the pharaoh Ptolemy I commissioned the Great Library project, appointing his adviser, Demetrius of Phaleron, to build the library and become its first director. It is said that the Great Library of Alexandria even had an intricate system of registration and classification. THE CELSUS LIBRARY— Another early library was the Celsus Library in Ephesus, built in 110 A.D. by the Council Gaius Julius Aquila. The library became one of the largest collections of antiquity, storing an estimated 12,000 hand-written books. Books could not be taken out of the library, but were handed to readers by library officials and read in the reading room. The scrolls of the manuscripts were kept in cupboards in niches on the walls. There were double walls behind the bookcases to prevent them from the extremes of temperature and humidity. The capacity of the library was more than 12,000 scrolls. It was the third richest library in ancient times after the Alexandra and Pergamum. The facade of the library has two-stories, with Corinthian style columns on the ground floor and three entrances to the building. There are three windows openings in the upper story. They used an optical trick that the columns at the sides of the facade are shorter than those at the center, giving the illusion of the building being greater in size. THE BODLEIN LIBRARY—This library is the oldest surviving library and is located in Oxford, England. The Bodleian collection consisted not only of books and manuscripts; it housed pictures, sculptures, coins and medals, and ‘curiosities’: objects of scientific, exotic or historical interest. There’s even a stuffed crocodile from Jamaica! Today’s Bodleian claims to hold eleven (11) million volumes, and to offer fuller access to online publications and databases than any other academic institution in the UK. CHETHAM’S LIBRARY (Manchester, England) — Chetham’s library is said to be Britain’s oldest surviving public library. Karl Marx visited the library in 1846, at the invitation of his friend Frederick Engels. In the bay of the library’s reading room, they carried out the research for Das Kapital. Over the years, water seeping into the masonry of the building has threatened the structure. Fortunately though, English Heritage has provided grants that will be used to restore this beautiful and significant national treasure. LIBRARY OF CONGRESS— The Library of Congress, founded in 1800, is said to be the oldest federal cultural institution in the United States. However, like the libraries of Ephesus and Alexandria, it became a victim of fire. During the War for Independence in 1814, British troops burned the Capitol building and destroyed the Library’s core collection of 3,000 volumes. One year later, however, Congress approved the purchase of Thomas Jefferson’s personal library of 6,487 books for $23,950 and the Library was restored. Today the Library of Congress claims to be the largest library in the world, with nearly 142 million items on approximately 650 miles of bookshelves. The collections include more than 32 million books and other print materials, 3 million recordings, 12.5 million photographs, 5.3 million maps, 5.6 million pieces of sheet music and 62 million manuscripts. THE BRITISH LIBRARY(LONDON, ENGLAND)– Compared to many other significant libraries, the British Library is relatively young having been brought into existence in 1972 by the British Library Act. The 1971 White Paper recognized that the constituent bodies of the proposed British Library (principally the British Museum Library) were seriously short of space and that re-housing the various collections was a top priority. The new library combines various components, the best known of which were the library departments of the British Museum, then one of the largest libraries in the world. Lenin had been impressed. It held, he said, a more comprehensive collection of Russian books than the libraries of Moscow and St Petersburg. Other famous visitors to the reading room included Marx, Charles Dickens, George Bernard Shaw and Virginia Woolf. As is so often de rigueur with projects of such vast scale, the St Pancras building became mired in delays and spiraling costs, but was finally opened by the Queen in June 1998. We have taken a very brief look at libraries of ancient times, so let’s look at contemporary libraries in modern times. A most impressive fact about modern-day libraries is the architecture of the building the books are housed in. The top ten (10) in the world are architectural marvels, not to mention the number of volumes, magazines, tapes, movies, newspapers, microfiche, etc etc contained within the buildings. To demonstrate this fact, let us now look at several digital photographs at the architecture of several modern-day libraries. I certainly hope the internet does not cannibalize our desire to read books. To me, picking up a written manuscript is far preferable to reading online. It is just not the same.